The fluid-cell cuvettes are placed in the side-by-side object and reference beam paths within a telecentric lens. The two Fresnel biprisms and four focusing lenses of the telecentric lens places a focal point within the fluid-cells and then re-collimates the object and reference beams for continued propagation through the optical loop. The fluid in the object beam path is heated with a miniature point source heater. The reference beam fluid is at constant temperature and provides balanced or equivalent reference beam re-collimation with respect to the object beam at the output of the telecentric lens. 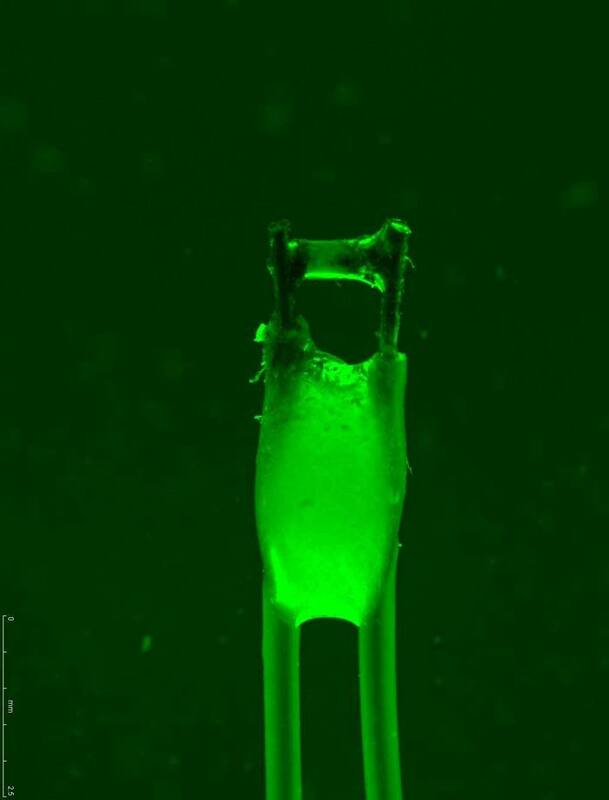 A closeup micro-photograph of the resistive heating element provides a 0.5 mm wide active heating region. The heating element is placed near the bottom of the fluid-cell and cross-sectional centered in order to produce radial diffusion based heat transfer to the silicone oil in the fluid-cell cuvette. The phase-shift for a central chief ray is different than the marginal perimeter edge rays due to the different lens thickness along the optical path. 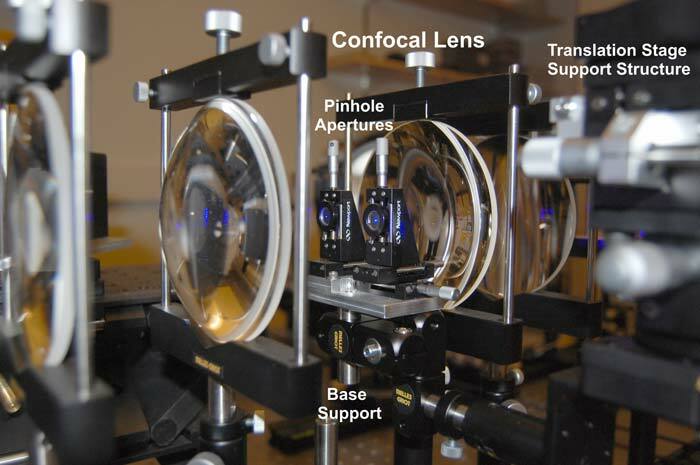 The hologram fringe contrast for various telecentric lens configurations is shown in the figure below. A bi-convex focusing and re-collimating relay lens with the chief ray propagating through the lens center produces a bell shaped fringe contrast in the hologram as seen in (a). A specimen with dominant aberrations is placed at the focal point converts the bell shaped fringe contrast to a dish shaped fringe contrast as seen is (b). Both the reference beam and the object beam that propagate through the same lens will produce a flat fringe contrast due to the ray crossing at the focal point as seen in (c). At the focal point the marginal rays flip over so that the marginal rays of the beam have the same optical path length or phase-shift as the chief ray after passing through a symmetrical set of lenses. A specimen is placed at the object beam focal point and a phantom specimen is placed at the reference beam focal point which will produce a dish shaped fringe contrast across the hologram as seen in (d). Configuration (d) is the telecentric lens configuration of the CSLH microscope. A flat fringe contrast across the hologram is desired to more accurately determining a fringe translation or phase-shift. Complete beam overlap at the camera coincides or aligns the dish shaped wavefronts for the object beam and the reference beam. The marginal rays of the aligned superimposed beams at the camera are necessary for minimizing reconstruction error. The reference hologram compensates for most of the optical aberrations that affect the fringe contrast across the hologram. Fringes occur in the region of beam overlap where the coherent waves of the object beam and the reference beam interfere. Moir� patterns from hologram fringes are created by inline interference, Fresnel near-field diffraction, and spatial data sampling. Moir� patterns and hologram fringes provide measurement of minute displacements along with geometry information for the microscope. The angular shearing displacement of two diffraction gratings provides nano-radian measurements from fringe shifts in a hologram. High resolution angular measurements are obtained from discernable fringe shifts of a Moir� pattern which represent displacements that are less than the wavelength of light. The advantage of my shearing holographic method using two diffraction gratings is the grating line crossing point displacement is large for a small change in angle and the resulting hologram exhibits periodicity. Using a Fourier transform hologram image processing method for the periodicity provides a more accurate angular measurement based on optical physics, grating interference, and applying a LSE (Least-Square Error) image processing algorithm.